Feast of Victory Lutheran Church, Elk Rapids, MI. Illustrated lectionary readings at Vanderbilt Divinity . Evangelectionary, January 26, 2014, Jonathan Shively, Evangelism Connections. "A Call to Follow," SAMUEL, Kathryn Matthews Huey, Sermon Seeds, UCC, 2017. Preaching Helps (Epiphany 3). Rev. Dawn Chesser, United Methodist Church General Board of Discipleship, 2014. Girardian Reflections on the Lectionary, Epiphany 3, by Paul Nuechterlein & Friends. Rumors, January 27, 2008, Ralph Milton, "Sermon helps for preachers with a sense of humor." Jesus Now, Epiphany 3A. Lectionary, study and worship resources from Faith Futures Jesus Then & Now. Readings, Analysis of Text and Preaching Paths from Dennis Bratcher, Christian Resource Institute. (Church of the Nazarene.) Commentary focuses on Isaiah text. Living by the Word, T. Denise Anderson, The Christian Century, 2017.
peace on justice, Barbara Born, 2017. "Christ's Mind in Us," Dan McClain, Ekklesia Project, 2017. "The Man on Display for All to See" - Marting Luther King, Nancy Rockwell, The Bite in the Apple, 2017. "Trump's Inauguration and Conflicted Hope in a Divided Christianity," Billy Honor, ON Scripture, 2017. "Called Together," Sharron R. Blezard, The Stewardship of Life, 2017. "A Shattered Yoke," Bob Cornwall, Ponderings on a Faith Journey, 2017. "Living a Dream," Dan Clendenin, Journey with Jesus, 2017. "The Earthly Kingdom vs the Kingdom of God," Jim Dahlin, 2017. "Why You Leave Your Nets and Follow," Andrew King, A Poetic Kind of Place, 2017. "Reframing," Journey to Penuel, 2017. "A Great Light," Lynn Miller, Art & Faith Matters, celebrating our creative and living God by generating art and architecture resources for congregations and individuals. Art and Faith Matters facebook page contains additional resources. "The People Who Have Walked in Darkness," David Sellery, 2014. "488 years later: Resources for Black History Month," Dan Clendenin, Journey with Jesus, 2014. 2011. "Lectionary Notes," Beth Quick, 2014. "Whose You Are," Anna MacDonald Dobbs, Ekklesia Project, 2014. "Jesus in Pieces?." Sharron R. Blezard, Stewardship of Life, 2014. 2011. "The Light in Focus," Thomas Beam, 2014. "Imagine That!" David Lose, Working Preacher, 2011. The Painted Prayerbook, Catch of the Day, Jan Richardson, 2011. Use of images. Nails, Tires and Hope, Melissa Bane Sevier, Contemplative Viewfinder, 2011. "Perfect Panic Strategy," Epiphany 3A, Peter Woods, I Am Listening, 2011. Dylan's Lectionary Blog, Epiphany 3A. Biblical Scholar Sarah Dylan Breuer looks at readings for the coming Sunday in the lectionary of the Episcopal Church, 2005. "Power and Unity," Mark Handley Andrus, Proclaiming Gospel Justice, The Witness, 2005. "Drop Everything," by Jim Somerville. A Sermon for Every Sunday: video sermons from America's best preachers for every Sunday of the Liturgical Year. "Ordinary People," Sil Galvan, 2017. "Denominations," Frederick Buechner Sermon Illustrations. Ministry Matters, January 26, 2014. "Fly Fishing for Christ," the Rev. Ken Kesselus, Sermons that Work, Episcopal Digital Network, 2014. 3 Epifanía (A) – 2014, POR EL RVDO. NAPOLEÓN BRITO, Sermones que Iluminan. "The Speed of Light (Isaiah 9)," Connections to Next Sunday Resources, 2017. "No Partiality," Faith Element, 2014. "A Call to Follow," Weekly Seeds, UCC, 2017. Bible Study, Epiphany 3, 2014, Debra Goebel, Sermons that Work, Episcopal Digital Network. Estudio de la Biblia. 3 Epifanía (A) por Debra Goebel, Sermones que Iluminan, 2014. "A Light Has Dawned," "Changing Darkness into light," Epiphany 3, Lesson Plans that Work, Episcopal Digital Network, 2014. Worship Planning Helps (Epiphany 3): Worship & Preaching Notes, Hymn Suggestions and Worship Resources from the United Methodist Church General Board of Discipleship. Life in Liturgy, Epiphany 3 / Christian Unity, Disciples of Christ, 2017. Jesus Begins His Ministry and Calls Some Disciples -- Worship resources for Epiphany 3 by Wayne H. Keller from SermonSuite. Mustard Seeds, "Discipling 101/Abandoning the Boats," Epiphany 3, 2014. A lectionary-based ideas resource for leaders of contemporary worship, Ann Scull, Gippsland, Australia. LCA Worship Planning Page, Epiphany 3A, 2014. Worship Resources, Epiphany 3A, 2011, John van de Laar, Sacredise. Lectionary Liturgies, Ordinary 3A, Thom M. Shuman, Presbyterian Church (U.S.A.). Liturgy for the Celebration of Life, Epiphany 3A, 2011. Liturgies from a Progressive/Post-Liberal Theology, Revd Rex A.E. Hunt, Uniting Church in Australia. Worship and Liturgy Resources, Ordinary 3, by Rev David Beswick, Uniting Church in Australia. Laughing Bird Liturgical Resources, Epiphany 3, by Nathan Nettleton, South Yarra Community Baptist Church, Melbourne, Australia. Prayers, blessings, Eucharistic prefaces and scripture paraphrases. Lector's Notes, Ordinary 3, Gregory Warnusz, Saint Jerome Parish, Bellefontaine Neighbors, MO. Notes and commentary for those reading this week's lectionary texts to the congregation. The Billabong, Epiphany 3, by Rev Jeff Shrowder, Uniting Church in Australia: Hymn suggestions and paraphrases of lectionary Psalms. Introductions to lectionary readings for readers, Proper 3A. Chris Haslam, Diocese of Montreal. Creative Closing, Ordinary 3, George Hartwell, at Richard J. Fairchild's Sermon & Lectionary Resources. 21st Century Worship Resources, Epiphany 3, UMCDiscipleship.org. Offertory Prayers, Epiphany 3, UMCDiscipleship.org. "Accept the Consequences,", Suzanne Guthrie, At the Edge of the Enclosure, prayers and meditations, 2011. The Timeless Psalms: Psalm 27, Lent 3A, Joan Stott, prayers and meditations based on lectionary Psalms, 2017. HermanoLeón Clipart, Sunday 3. Free clipart, backgrounds, slides, etc. Clip Art, Ordinary 3, Fr. Richard Lonsdale, Resources for Catholic Educators. Ordinary 3 at Cerezo Barredo's weekly gospel illustration. Follows Latin American Roman Catholic gospel reading, though most gospels texts/themes are found in the index. Liberation emphasis. 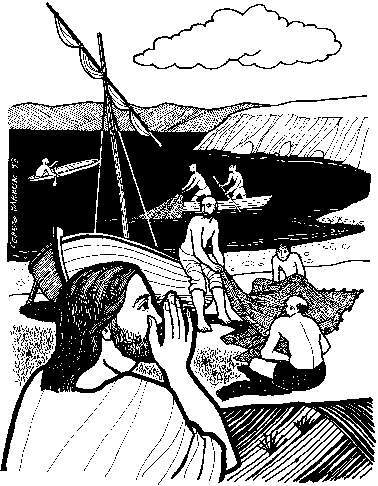 Mustard Seeds, "Discipleing 101/Abandoning the Boats," Epiphany 3, 2014. A lectionary-based ideas resource for leaders of contemporary worship, Ann Scull, Gippsland, Australia. Isaiah 9:1-4, The African captives in Amistad sit in darkness but see "a great light." Visual Parables, Ed McNulty. "String Magic Trick," video, John Stevens, Dollar Store Children's Sermons, 2014. "The Light," Brenton Prigge, New Hymn. Hymns of the Spirit Three, Epiphany 3A, Richard E. Hurst, Universalist National Memorial Church. Hymn and Song Suggestions, Epiphany 3A, 2017, annotated suggestions from Natalie Sims, Singing from the Lectionary. Lectionary Hymns, Epiphany 3, UMCDiscipleship.org. Shepherd Sounds, Epiphany 3. Background information for hymns and choral music following the lectionary from the Episcopal Church of the Good Shepherd, Austin, Texas, by Eric Mellenbruch and David Zersen. Liturgical Planning and Music Suggestions, Ordinary 3, CanticaNova Publications. Sing for Joy, Epiphany 3A, 2008. Choral reflections on this week's lectionary readings, St. Olaf College. Weekly Devotion, Faith Formation Journeys, 2014. Lectionary Puzzles, Epiphany 3. Word search puzzles in RTF or plain text, by Reg McMillan, St.Stephen's Presbyterian Church, Peterborough, Ontario. Gospel Puzzles for the Lectionary, Epiphany 3A, Mark Ryman, edoxy.com. "What Do You Want To Be?" Fran Woodruff, On The Chancel Steps, 2014. Gone Fishing -- Children’s sermon by Anna Shirey based on Matthew 4:12-23 from SermonSuite. "A Light Has Dawned," Epiphany 3, Lesson Plans that Work, Episcopal Digital Network, 2014.